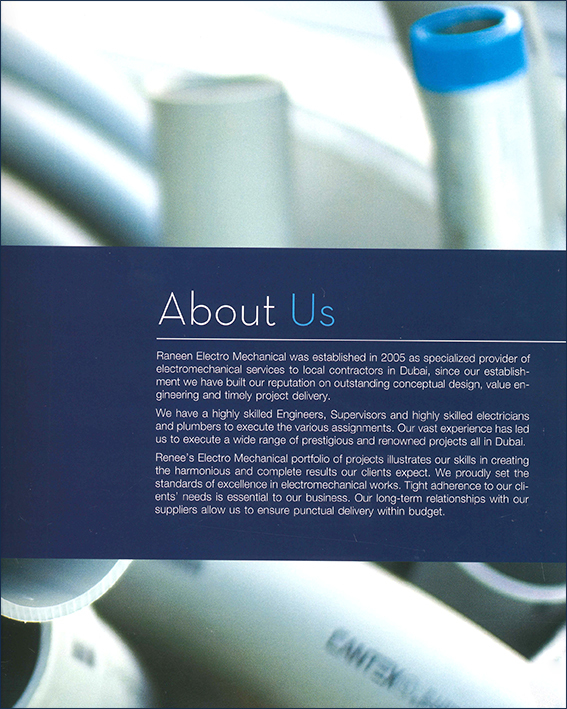 Raneen Electro Mechanical was established in 2005 as specialized provider of electromechanical services to local contractors in Dubai, since our establishment we have built our reputation on outstanding conceptual design, value engineering and timely project delivery. We have a highly skilled Engineers, Supervisors and highly skilled electricians and plumbers to execute the various assignments. Our vast experience has led us to execute a wide range of prestigious and renowned projects all in Dubai. Renee’s Electro Mechanical portfolio of projects illustrates our skills in creating the harmonious and complete results our clients expect. We proudly set the standards of excellence in electromechanical works. Tight adherence to our clients’ needs is essential to our business. Our long-term relationships with our suppliers allow us to ensure punctual delivery within budget. At Raneen we specialise in a wide range of electro mechanical and general services. Our team has an excellent level of expertise that supersedes our performance and puts competition way up high. This explains why our clients trust us with high value projects and with this trust us we have proved our worth which is the end pay of with even more or better projects. Become a leading electro mechanical contractors in the local market through provide a high standard of services and quality of workmanship that will meet specified requirements and expectations of a large segment clients in Dubai. * Develop strong, trusting relationships with our clients, suppliers and employees. * Manage growth and guide operations with a strong central support team. * Constantly pursue customer satisfaction. * Offer the best working environment for our employees.